EDWARDSVILLE – Behind Brendon Irving's 26 carries for 109 yards and one score visiting Lebanon Valley College scored 31 second half points on way to a 48-17 victory over Wilkes University Saturday afternoon at Schmidt Stadium. With the defeat Wilkes slips to 1-6 overall and 1-5 in MAC games. LVC improves to 4-3 overall and 4-2 in conference contests heading into the final three weeks of the regular season. LVC got on the board first at the end of the first quarter using a long 16 play, 72-yard drive capped by a Travis Saylor seven yard touchdown reception from quarterback Tim Pirrone as the Dutchmen led 7-0 following the extra point. Wilkes responded to start the second frame using a long drive of their own deep into LVC territory. 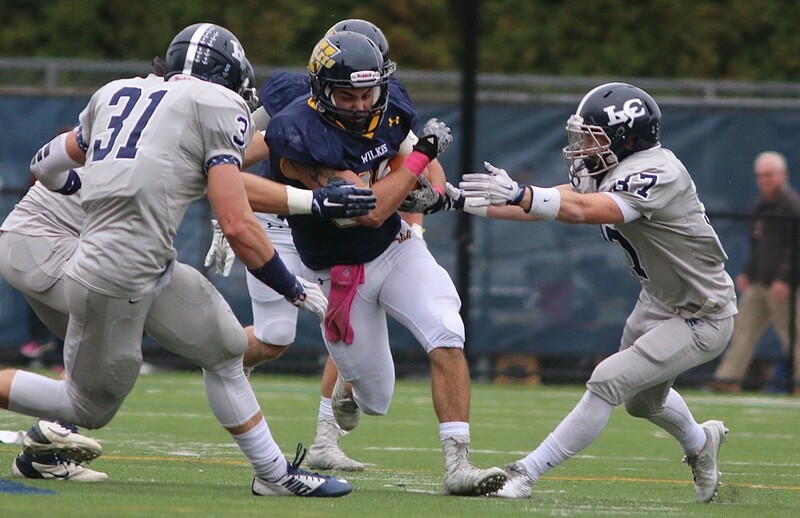 Ryan Dailey (Easton, PA/Wilson) connected with Aaron Coyne (Springfield, PA/Springfield) for 18-yard and 13-yard completions followed by rushes from PJ Incremona (Wood Ridge, NJ/Wood Ridge) that brought the Colonels down to the LVC 15. The drive stalled at the LVC 10 and Wilkes settled for a Carl Von Glahn(Hackettstown, NJ/Hackettstown) 28-yard field goal to cut the lead to 7-3 with 13:49 left in the first half. LVC added a field goal on its next possession, a 29-yard attempt from Marcus Brown upping the lead to 10-3 with 3:14 left in the half. The Colonels offense wasted little time tying the game at 10-10 when Dailey found a streaking William Deemer (Washington Township, NJ/Warren Hills) over the middle of the field scoring the 41-yard touchdown in the process leaving just 1:14 on the first half clock. LVC took the momentum right back at the end of the half using a seven play, 64-yard drive capped by a seven yard touchdown pass to take back the advantage at 17-10 at the break. Trailing 20-10 following an LVC field goal to start the third quarter, Incremona went to the ground again scoring from two yards out finishing a 12 play, 67-yard drive in the process. Following the extra point, the Colonels trailed just 20-17 with 7:02 left in the third quarter. From there it was all LVC as the visitors scored the game's next 28 points including one passing touchdown, two rushing touchdowns and an interception return for a score late in the fourth. Dailey finished 25-for-34 for 234 yards and one score but also threw two costly interception with one being returned for the defensive touchdown. INcremona led the Wilkes ground game with 18 carries for 67 yards and one score. Deemer was one of five Colonels with four or more receptions finishing with five catches for 71 yards and the touchdown. Pirrone led LVC going 15-for-24 for 160 yards and three passing touchdowns. He also ran for 33 yards and one score. Irving paced the ground attack with 109 yards on 26 attempts. Tanner Stengel (Allentown, PA/Parkland) led the Wilkes defense with 15 tackles including ten solo stops.Jason Ugwu (Collegeville, PA/Perkiomen Valley) added a season-high 11 stops while Jared Powell(Easton, PA/Easton) and Neojoe Lughas (Plainfield, NJ/Plainfield) each contributed ten tackles for the Colonels. Wilkes concludes its home portion of the schedule next Saturday on Senior Day hosting Stevenson University at 12:00 p.m. at Schmidt Stadium. The game also marks Veteran's Appreciation Day.